Christ wanted love to be called his single commandment. This we owe to all men. Nobody is excepted. Christ seeks souls, not property. ... He who wants a large part of mankind to be such that ... he may act like a ferocious executioner toward them, press them into slavery, and through them grow rich, is a despotic master, not a Christian. 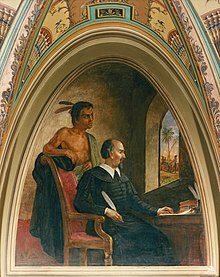 Never have the Indians in all the Indies committed any act against the Spanish Christians, until those Christians have first and many times committed countless cruel aggressions against them or against neighboring nations. Bartolomé de las Casas (November 1484 – July 1566) was a 16th-century Spanish historian, social reformer and Dominican friar. He became the first resident Bishop of Chiapas, and the first officially appointed "Protector of the Indians". His extensive writings, the most famous being A Short Account of the Destruction of the Indies and Historia de Las Indias, chronicle the first decades of colonization of the West Indies and focus particularly on the atrocities committed by the colonizers against the indigenous peoples. Men, from their early years, are reared in the midst of goods of the body and senses, the source of corrupt behavior, and, because they constantly deal with them, know them better. But spiritual things, the goods of reason, and things intellectual, which are far removed from the senses, they do not know as well. Because they understand and are always dealing with material things, but spiritual things are not so readily evident, it happens that men, for the most part, are plunged into sinful conduct. Christ seeks souls, not property. ... He who wants a large part of mankind to be such that ... he may act like a ferocious executioner toward them, press them into slavery, and through them grow rich, is a despotic master, not a Christian; a son of Satan, not of God; a plunderer, not a shepherd. And never have the Indians in all the Indies committed any act against the Spanish Christians, until those Christians have first and many times committed countless cruel aggressions against them or against neighboring nations. More than thirty other islands in the vicinity of San Juan are for the most part and for the same reason depopulated, and the land laid waste. We can estimate very surely and truthfully that in the forty years that have passed, with the infernal actions of the Christians, there have been unjustly slain more than twelve million men, women, and children. In truth, I believe without trying to deceive myself that the number of the slain is more like fifty million. After the wars and the killings had ended, when usually there survived only some boys, some women, and children, these survivors were distributed among the Christians to be slaves. And of all the infinite universe of humanity, these people are the most guileless, the most devoid of wickedness and duplicity, the most obedient and faithful to their native masters and to the Spanish Christians whom they serve. These people are the most devoid of rancors, hatreds, or desire for vengeance of any people in the world. Their reason for killing and destroying such an infinite number of souls is that the Christians have an ultimate aim, which is to acquire gold, and to swell themselves with riches in a very brief time and thus rise to a high estate disproportionate to their merits. It should be kept in mind that their insatiable greed and ambition, the greatest ever seen in the world, is the cause of their villainies. With my own eyes I saw Spaniards cut off the nose and ears of Indians, male and female, without provocation, merely because it pleased them to do it. ...Likewise, I saw how they summoned the caciques and the chief rulers to come, assuring them safety, and when they peacefully came, they were taken captive and burned. They laid bets as to who, with one stroke of the sword, could split a man in two or could cut off his head or spill out his entrails with a single stroke of the pike. They took infants from their mothers' breasts, snatching them by the legs and pitching them headfirst against the crags or snatched them by the arms and threw them into the rivers, roaring with laughter and saying as the babies fell into the water, "Boil there, you offspring of the devil!" They attacked the towns and spared neither the children nor the aged nor pregnant women nor women in childbed, not only stabbing them and dismembering them but cutting them to pieces as if dealing with sheep in the slaughter house. They made some low wide gallows on which the hanged victim's feet almost touched the ground, stringing up their victims in lots of thirteen, in memory of Our Redeemer and His twelve Apostles, then set burning wood at their feet and thus burned them alive. With still others, all those they wanted to capture alive, they cut off their hands and hung them round the victim's neck, saying, "Go now, carry the message," meaning, Take the news to the Indians who have fled to the mountains. They made a grid of rods which they placed on forked sticks, then lashed the victims to the grid and lighted a smoldering fire underneath, so that little by little, as those captives screamed in despair and torment, their souls would leave them.